Good morning, felinity assembled, Elvira Mistress of Felinity here! Not sure anyone noticed but...it has been 10 days since we last posted on the blog. It involves boxes and the "M" word. 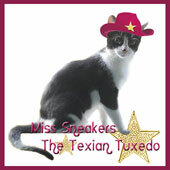 Daddy Kiril has a lot on his mind and Sneakers the Texian Tuxedo & I are helping him prepare for 2015. 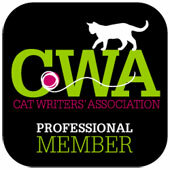 I will have more about this and the official 2015 Hosting Call for the Carnival (I am also putting together a little something about Carnival for anyone to share on their blog, as we try to look for hosts and spread the word to an ever growing pet blogging community with bloggers who have never heard of us), later in the week. So let's get to the Carnival! "They don't speak our language. They have communication issues. They are mostly subservient to 'man'. They live close to the ground, or high in trees. They go about their business ... the business of life... without regard to politics or weather or technology. They are the animals of the world. Why do we act as if they are mindless or blind or stupid? Why do we humans insist on our dominance?" It has been a very rough month for Mr. John, the human who lives with Maddie Cat, at StrangeRanger blog...His mother has passed away. "There is a movement right now to make Los Angeles a no-kill city, but it won’t be complete until the issue about Los Angeles’ feral cats is solved. Take some time today to find out what is happening with feral cats in your city, and make sure it does not happen in your own backyard!" 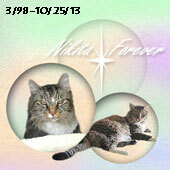 I Will NOT Stay Silent on National Feral Cat Day! 6. Over at Marian Allen's blog...Sweetie Pie is worried about a new cat book! "I attached a Hot Hand USB accelerometer to a cat collar and let Sophie run around and chase a fish-on-a-stick toy for a little while. I captured the MIDI output from this and fed it into a synth on Ableton Live." 8. Over at Brian's Home...Sister Gracie has found something new to dislike, hee, hee! 10. Over at Traveling Cats ...Cats from Spain. 15. 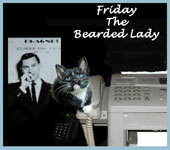 Over at Create With Joy...Homecomings and cats and a great photo of Tsunami & Magellan. 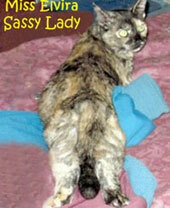 Thanks for helping spread the word about L.A.'s shabby treatment of feral cats by sharing my posts! What great stuff in this week's Carnival! Thanks for putting it all together, Elvira!